I'm looking for aluminum tubing .065 or a little less thick that is 60 inches long. I don't want to use PVC on this. I can find 48 inch, but nothing longer. Just nosy...why not the "Vonder material" PVC? Why not consider square aluminum tubes ? They are a lot less expensive than round. A 5 ft piece of 1.25" with a 1/8" wall is only about $15 here. Round costs twice as much for thinner walls. I've even used salvaged thin plastic 'golf tubes' like those in golf bags that hold the shafts. DaleH....quit giving out my secrets..."golf tubes, indeed"
p.s. you can buy them at church and charity thrift stores for about a quarter each. Rich didn't you have a post up somewhere on using a torch and a wine bottle to flare the thin walled PVC for making rod tubes? Yep....but as my idol Ronald Reagan once said ..."There you go again"
You've given the whole answer. If one wants to flare the end of a PVC (Vonder material) tube. Heat the end with a heat gun ( or your wife's hair dryer)....Stick it over the end of a wine bottle (drink contents first)...wait a minute until it hardens...Viola!!!! Flared tube ends! It really works best with the thinwall PVC, though I have done it with schedule 40. 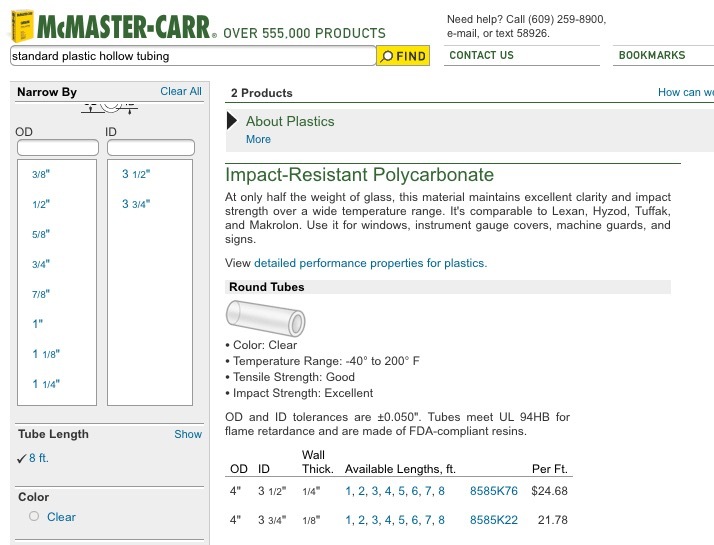 I'm looking at a 4 inch tube that will be leathered covered for a custom rod tube. Can you make up a flat 12 1/2 inch ( or so) piece of flexible tubing (any material); cover it in leather; and roll it into the tube that you ultimately want?. Look for fiberboard, acrylics are $21 to $25 per foot! I don't remember the exact size, but...the tubes that they roll carpet in are near what you are looking for. Tough stuff and free from your local carpet store. Spray the inside with a good sealer.